This was a meeting we as a small group of selected journalists had regarded with anticipation. In early May, I was asked via a telephone to join a 'candid talk' with Kemal Kılıçdaroğlu, leader of Turkey's Kemalist main opposition, Republican People's Party (CHP). The chat with some 20 journalists was cordial and, on some crucial issues, very frank. Not so surprisingly, many of us wondered how his party would act when the time came to vote to lift the immunities of the deputies in Parliament. In the room there was nobody who doubted that the move was part of the design of President Erdoğan to seize control over the fate of the opposition, in particular pro-Kurdish Peoples' Democracy Party (HDP), but also the very CHP itself. Intent on 'criminalizing' the dissent among the elected was utterly clear. Then, in a sharp swing, he started telling us how passionately engaged his party was about resolving Turkey's now gangrenous Kurdish issue. At the point of whether it was Erdoğan or the PKK who turned down the table of peace talks last July, he said something - without a warning on off-the-record - which made us all gape at each other. 'We all know, don't we, that it was not the PKK who murdered those two police officers in Ceylanpınar,' he blasted, referring to an incident on July 26 last year, day after which Erdoğan declared that the 'peace process was over'. We wondered why on earth he did not come out and made it an issue against the AKP. No response. Weeks after, the vote in Parliament was, apparently, exactly as Turkey's mastermind of political engineering, President Erdoğan had desired it to be - 376 'yes' votes (out of a total of 550)to lift the immunites now not only severely limited the free speech among the elected, but paved the way for imprisonment of them. Many observers, devoted supporters and even some deputies were perplexed about 'the state of limbo', becoming permanent, wondering aloud whether or not it is the very CHP that stands as a wall between a majoritarian, oppressive AKP and the prospects for a democratic opposition front. They did not need to. Steadfast in Kemalist dogma, CHP limited its position only to defend secularism, while it displayed staunch disinterest to seek some 'democratic common ground' with the HDP, thus losing further credibility to turn into a 'party for the underdogs'. Many argue today - not without reasons - that it is a stumbling block for formation of any meaningful alternative to power. So, once more, the opposition - CHP and MHP - are at the center, as twin actors representing two flanks of Turkish nationalism, to have caused a historic loss of momentum for Turkey, which, under the iron grip of its President Erdoğan, comes closer to an autocratic rule. The cycle is almost complete. On his path, which he following the general election in the summer of 2011, Erdoğan set nothing but a fully empowered executive presidency, shielded by absolute impunity. That goal seemed inevitable, given the fact that he has been facing two massive graft probes, which now extended into a legal case in the USA, and his alleged role in arming Syrian jihadist groups is being intensely debated. He has to keep bcycling, in order not to fall. 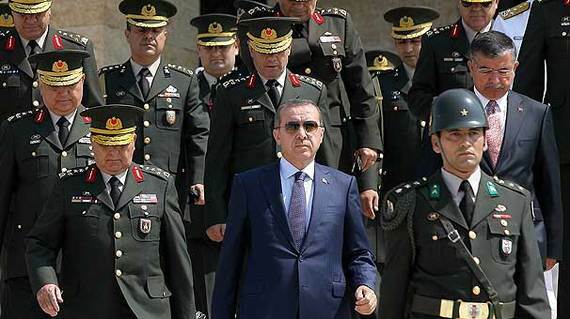 This explains, too, his choice for emerging every day as a tough national leader and the wave of populism he propagates for and the ceaseless efforts to forge alliances with the backbone of the 'old guard' of Turkey - the military. His outbursts against the West, including Turkey's allies and the EU, seem at times incomprehensible outside, but if one realizes how Russia's Putin and Erdoğan copy-paste each other's behaviour, it becomes easy to explain why they are so popular among the large majorities in their countries and how they are able to control the the crowds' perceptions. But the reality of Turkey becomes much more complex if one goes beyond the person of Erdoğan himself. The real question is how this masterful politician for years played one social group against each other, and how he managed after pushing back the powerful military of Turke to form a new oligarchy, which under the banner of Militarist-Islamist Nationalism help him form an authoritarian rule - doomed to steer away Turkey from the EU for good. Utterly anxious to be held accountable for abuses of power, what he did was a series of seizures of the basic tenets of the republic's 'semi-democratic' system. From 2011 he systematically took control of large segments of the media, as he launched - often defying the law - a purge within the security and judicial apparatus that led to their subordination to government. He challenged with success all the independent checks and balances institutions, by placing his loyal cadres into them. 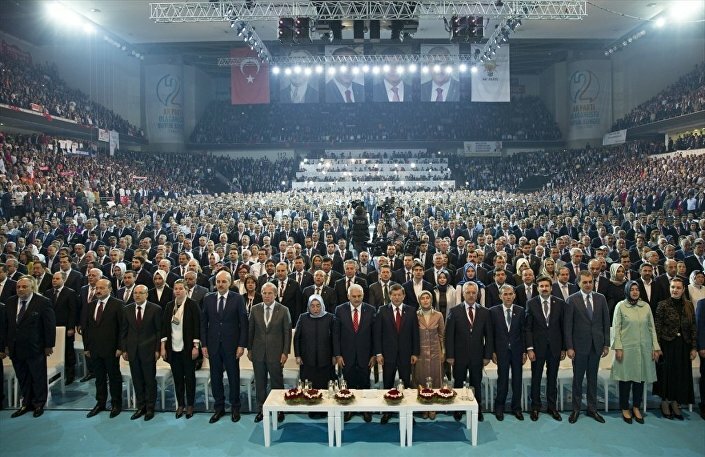 No wonder, then, all the people attending the latest AKP congress stood up, in Soviet style, when his message was read out loud, in an act of absolute loyalty. In hindsight, it seems logical that even the Kurdish Peace Process with the PKK was kept intact, until the time came to overturn it - last summer. Erdoğan apparently realized that going further with the talks would weaken his and AKP's stand, and lead to his fall. Thus, pragmatist to the core, he chose to cut an alliance with the military - his old foe - and all the nationalist circles reassembled in and around his party, marking a sharp u-turn, abandonment of all reform policies and waving a final farewell to democratisation. As a consequence, the AKP, which had started its journey as a civilian movement of realignment for democracy, has turned into another 'party of the state' - a merger of the Islamists with the old guard of the Turkey's 'tutelary state' had become a fact by the end of 2015. Skeleton of the very tutelage remains intact, with the difference that, while the military re-enters the stage as an actor, it is 'balanced' by the most powerful state institution representing the Sunnis: Directorate of Religious Affairs (Diyanet). The latter, by edicts proves to be a very useful tool for the AKP to enhance its hegemony. But this is where, in the formation of a new 'pro-state alliance' the plot thickens for me as an observer as well as many others. There is no doubt that his cunning political moves have served Erdoğan perfectly so far. His populist rhetoric - coloured by constant use of the terms 'national will' or phrases like 'people express its response thrpugh the ballotbox' - paves the way for majoritarianist rule, as he pushes with full force for a constitutional amendment that will have to bring empowered presidential rule to Turkey. How will that happen without a reasonable consensus? What will the consequences be when the entire elected Kurdish block is expelled from Parliament, with even CHP partially 'criminalized', and large segments of Turkish society alienated, further polarised? What if the Kurdish conflict turns into sheer civil war, with a possible 'Kurdish Parliament' formed as a reaction? Hard questions. Yet, one thing is certain: Cast much farther away from Copenhagen Criteria than before, and increasingly indifferent to European Treaty Of Human Rights, Turkey now crawls through - with the backbone of its system broken - to an autocratic model, that resembles Central Asian models, falling into the grip of one man. Let me conclude with a fresh snapshot. Just days ago, visiting his hometown, Rize, Erdoğan was accompanied by the three high judges - chairmen of the Court of Cassation, Court of Accounts and Council of State. Pictures of these men picking tea leaves together raised the eyebrows only in a couple of newspapers, like Cumhuriyet, which asked whether or not the transition to a one man rule was now complete. Two years ago, in the March issue of the German edition of Le Monde Diplomatique, I had coined the term 'Slow Motion Coup' (Putsch I'm Zeitlupe) in the headline of my article on Turkey. Two years later, what I see is a fast forward type of the process, with Erdoğan, detecting far less obstacles on his path to absolute power. He is almost there, arguably only months away. No matter what the outcome of this attempt, the impact of this moment of rupture of Turley's will be immense, reaching far beyond its borders.